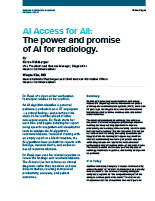 The Nuance AI Marketplace unlocks the powers of AI for radiologists, enabling them to quickly analyze medical imaging by readily accessing algorithms trained on the huge volumes of imaging data, and to integrate this into their day-to-day work. It does this by providing developers and data scientists with the ability to define, build, publish, use, and improve imaging algorithms, accelerating the creation and adoption of imaging AI. The Nuance AI Marketplace is designed to be a prime source for imaging algorithms that augment the capabilities of radiologists and provide rapid, open access to the industry’s most advanced research. Nuance launched the AI Marketplace with numerous partners including NVIDIA, which is democratizing the development and deployment of AI across multiple industries. Other organizations supporting the AI Marketplace include some of the nation’s leading healthcare and academic organizations, such as the American College of Radiology, Ohio State University, Lunit, Radlogics, Aidence, and TeraRecon. To learn more, please request the white paper.